For 12 hours starting at 9 a.m. this Martin Luther King, Jr. Day (Monday, Jan. 19), MTV will mark the civil rights leader's memory by airing in black and white. 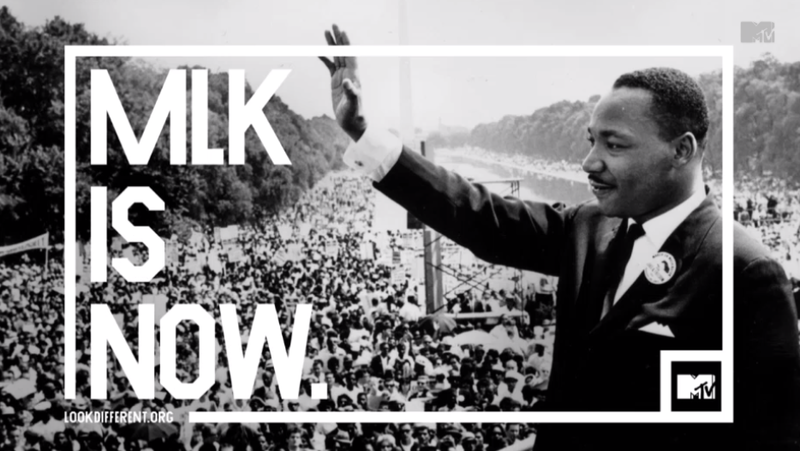 As part of its ongoing anti-bias campaign, Look Different, MTV will launch a new series of PSAs titled "The Talk" on MLK Day. The spots will run at the beginning of every ad pod throughout the day. They'll feature reflections on race from public figures, many of them people of color, including Kendrick Lamar, whose most recent album dropped to near-universal acclaim; and Ava DuVernay and David Oyelowo, both widely praised (though snubbed by the Academy) for respectively directing and starring in MLK biopic Selma. "Millennials believe strongly in fairness, but they can also find it difficult to talk openly about race—to be not simply 'color blind' but 'color brave,'" said Stephen Friedman, president of MTV. "Our audience is looking for a way to bring the national conversation on race into their homes, and this campaign will give them a forum to express true color bravery." The PSAs that will air during the black-and-white programming block focus on encouraging open discussions of race rather than simply trying to ignore the cultural, social and political realities of race in America. "To be color blind is not a thing I think that one should boast about," says DuVernay in her PSA. "See color and celebrate it. See our differences and celebrate it. When someone says to me 'I'm color blind, I don't see color', I'm thinking they're missing out." Others participating in the initiative include Civil Rights pioneer and U.S. Rep. John Lewis of Georgia, Sen. Cory Booker of New Jersey, singer Jordin Sparks and Fall Out Boy bassist Pete Wentz. Although Booker and Lewis are Democrats, the campaign also includes a message from Republican Sen. Rand Paul of Kentucky. While some critics may say MTV is simply trying to draw attention for itself amid a volatile period of race relations, it's worth noting that most businesses marking MLK Day would rather treat King's struggle as a matter of history rather than an issue still alive today. "It is important to talk about race because we live in a racial-conscious society," says longtime civil rights leader Lewis in his message on MTV. "We cannot sweep the issue of race under the American rug or into some dark corner."